i love bridal bouquets filled with dahlias, anemones, ranunculus, astilbe, & spray roses, in rich colors accompanied with different grassy greens like fern or eucalyptus help to create a fall like vibe. the key here is color- go bold with vibrant reds, marsala, & dark burgundy. balancing out your bouquet with neutrals will also help your other colors really pop and appear richer. instead of choosing a pale pink, go for a bold red lip for your wedding day look to create a dramatic fall feeling. if you can, choose a matte finish to last the longest throughout your wedding day, plus, it’s the least likely to transfer or smudge onto your new groom! a favorite red lip of mine is charlotte tilbury’s matte revolution lipstick in red carpet red. otherwise, if you’re not feeling the red lip, you can always try a ruby hue on your nails. either option will look great in photos! for your bride tribe opt for moody hues! for even more fun, go the mismatched route and have your girls in a fall color of their own. mustard, rust, red, navy, olive green, you get the idea! mini pumpkins are almost effortless in helping your decor feel very fall, + they’re super cute and require little to no work! 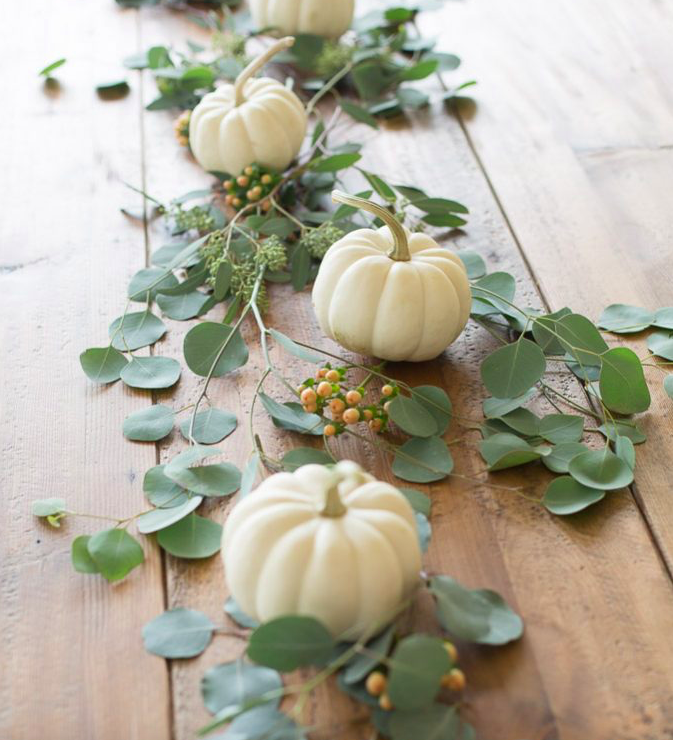 create welcoming statements on your guests tables with mini pumpkins and easy floral like baby’s breath or greenery to create a fun autumn statement. instead of having a cake why not have pumpkin pie?! accompany your pumpkin pie with hot apple cider and you’re definitely going to have a crowd pleasing dessert that is anything but ordinary. you can also go the mini/bite sized route and do mini pies in other fall flavors like apple or cherry. hello from buck & rose!